Capitol spelt with an "O" was one of the original bouquet of late 70's Dublin pirates, and heard often on 1332kHz, probably 1331kHz before the frequency changes of November 1978. 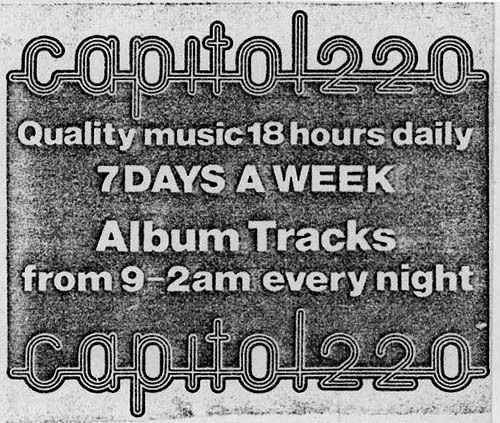 Capitol featured album music. It is uncertain if we have even seen any promotional material for the station, bar a couple of poor quality things from Sounds Alternative. Notice one of the ads lists the wavelength as 226m, and one 220m. Recording of Capital Radio heard in Scotland, 17th June 1978. Mic quality in those days sadly. Also included is a recording made by DS in Ireland in 1979.